Hopping Fun Creations - Crime Science! Click on the titles for details at Amazon. Crime Scene Investigator is available in Turkish! First of all: Wow! In my opinion, this book is very well written and is just right for this age group. It flows with the ease of being told by an adept storyteller. The style is friendly and engaging, and the subject matter is intriguing. What kid wouldn’t be fascinated? I believe that middle school kids—and likely younger and older ones too—will have difficulty putting it down. The first person interviews—such as Sharon Plotkin and Nichol Jennings—are so real and inspirational! These are even more effective than the more typical “capsule” job descriptions. First and foremost, this book emphasizes the foundational role of observation, which is just plain good science! Too often, by the time students reach late elementary or middle school level, it is assumed both that they know how to observe and that they appreciate the importance of careful observation—meaning more than a quick glance. This book and this topic make the point exceptionally clearly without overdoing it. Each of the cases develops with... just the right amount of suspense. I wanted to know what would happen, what the investigator would find, what it would mean. I found that I wasn’t just watching, I was thinking about it. This is excellent for modeling and reinforcing scientific inquiry! Pure scientific inquiry is explained, modeled, and reinforced repeatedly and strongly. Once again I am impressed by the easy, comfortable style of writing, unfolding the scene in the manner of a good storyteller. I believe that kids and adults are going to find themselves captivated by the text from the start. I certainly have been! The story line is engaging from the beginning to the end. I think that ending with a case for the reader to try to solve works particularly well. Another strong point is the inclusion of the genocide situation [in Rwanda]. This piece takes the reader to a whole new realm. I’m sure that most of the topic-related information could have been covered quite well by sticking to local homicides. I’m glad that the author took us in a different and much more global direction. That was important. One of the strengths of this book and this series is the continual application of content pieces in a real life setting—such things as gravity’s effect on blood, the physics of cooling related to the mass of the object, movement of heat, thermograms … I think it has just the right amount of connecting, without forcing or overdoing it. This book should be a welcome resource in the classroom for any number of topics. Q. Why did the eloquent criminal get off lightly? A. He said pretty pleas. Investigating a Crime Scene is about the science behind observing, collecting, preserving, and interpreting evidence found at a crime scene. Featured cases range from a simple burglary to murder. Cleveland detective Nichol Jennings told me, step-by-step, how she and Detective Mike Smith slowly and carefully worked the scene of a single-bullet shooting and helped nail the murderer by pressing a button! I also interviewed her partner, Ann Marie Ziska, who completed an intense crime science training program at the National Forensic Academy in Tennessee. Sharon Plotkin, who investigates crime scenes in North Miami, Florida, taught me a great deal about procedures and how to think like an investigator—keeping an open mind, letting the evidence speak for itself, asking questions about the criminal's behavior, and making observations and inferences to figure out what's evidence and what's not. How did the criminal enter and exit the scene? What did he or she touch? What's missing from the scene? Where might latent (invisible) evidence be lurking? Did the criminal stage the scene to throw off investigators? Detective Don Hrycyk of Los Angeles Police Department Art Theft Detail Unit helped me turn one of his burglary cases into a crime scene challenge. We outline the evidence found at the large estate of a movie producer, including forensic photos, and challenge readers to interpret the evidence for clues. Something's definitely fishy about that broken window (above), and it takes a Sherlock-like observation to figure it out. As part of my research for The Body as Evidence/Autopsies, I interviewed Colorado coroner Mike Dobersen just after he performed a three-hour autopsy on a homicide victim. He stepped me through his investigation at the crime scene, examining the corpse as it was found by fire fighters, and then the operation in which he searched for forensic clues to the manner and cause of death. I also contacted forensic anthropologist Clea Koff, who investigates mass graves, starting with two horrifying sites in Rwanda, Africa. As a member of the Physicians for Human Rights (PHR) team, she helped exhume hundreds of victims of the 1994 genocide in that country and to document skeletal evidence for an ongoing international tribunal. More than two dozen military and government leaders have been convicted of instigating the killing of more than half a million Rwandan citizens. In this book, I also discuss the biology of death, including the medical causes and how a corpse changes from the moment of the last breath over the first 72 hours and then days, weeks, and months later. Featuring real murder cases as examples, I explain how body temperature, rigor mortis (temporary muscle stiffening), lividity (blood pooling), decomposition, the life cycle of insects, and other clues help medical examiners estimate time of death. The last chapter features excerpts from an actual autopsy report. Can you spot the "smoking gun" clue on the body that led California detectives to the scene of the crime and, ultimately, the murderer? Young CSI fans will be engrossed by this title in the Crime Scene Science series. The well-balanced mix of case studies, scientific explanations, and descriptions of fieldwork offers a dynamic, behind-the-scenes look at crime-scene investigations. Hopping doesn't sensationalize; she focuses on facts: "a rotting corpse releases about 400 chemicals into the air." 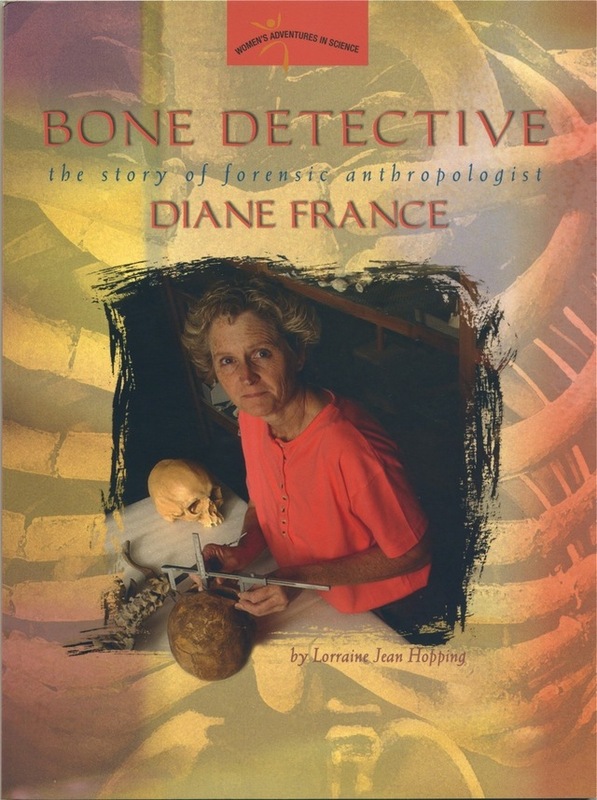 For more forensic science, check out my award-winning biography of Diane France.